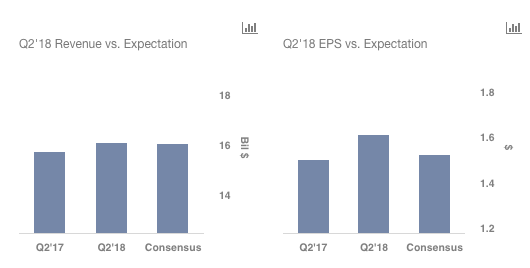 PepsiCo (NYSE:PEP) was able to beat consensus expectations on both revenue and earnings in the second quarter, helped by the strength in the snacks business. 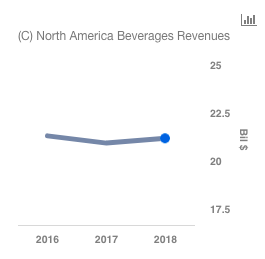 A shift away from sugary drinks has resulted in weakness in the North American beverage business, which continued in the quarter, although the rate of decline has improved to -1%. On the one hand, consumers are shifting towards healthier food and beverages, while on the other, PepsiCo’s Frito-Lay (FLNA) business, which primarily sells salty snacks, is performing quite well. Consequently, the continued weakness in the North American Beverage (NAB) segment did not hamper the company’s results as much in the second quarter, as its other segments, particularly FLNA, were able to deliver strong growth to offset the weakness. We have a $119 price estimate for PepsiCo, which is higher than the current market price. 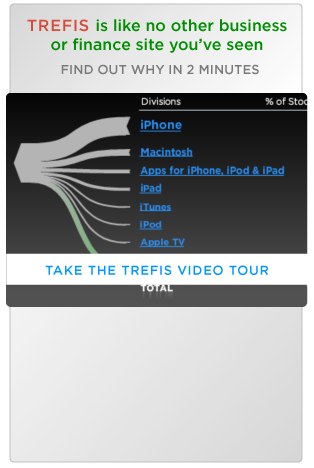 The charts have been made using our new, interactive platform. You can modify the different driver assumptions by clicking here for our interactive dashboard for Pepsi’s Q2, to gauge their impact on the revenue, earnings, and price per share metrics. 1. Increased Marketing Spend For Core Beverages: While PepsiCo has moderately increased media spend over the past three years, its biggest competitor – Coca-Cola – has done so by a substantial margin. While this has benefited the latter, PepsiCo has struggled as a result. In response to this, the company has allocated increased media to trademark Pepsi. It has also launched a new “Pepsi Generations” campaign, with PepsiCo improving sales and market share as an outcome. On the other hand, this step has pressured the operating margins of the company, offsetting any benefit received from the productivity initiatives implemented by the company to induce cost savings. Moreover, the company faced higher transportation and commodity costs, which were other factors that resulted in the operating profit falling 16% for the segment in the second quarter. 4. Growth Of Healthier Beverages: With the growth of its beverage business slowing down, as a result of sluggish soda sales, the healthy products segment will be a focus for the company in the future to drive its sales. PepsiCo’s tea portfolio, with brands including Lipton and Pure Leaf, has grown retail sales in the range of mid-single digits to as high as 21% over the past 17 quarters. In enhanced water, both LIFWTR and the newly launched Bubly have grown nicely. KeVita, PepsiCo’s line of premium organic live probiotic beverages, grew retail sales 50% in Q1, following 66% growth for the full year 2017, and continued its strong performance in this quarter. The growth of these brands is highly important for the company, as significant growth here may help to offset some of the weakness in the core portfolio. 5. 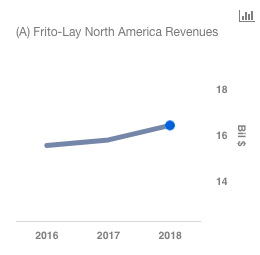 Importance Of Frito-Lay: Frito-Lay North America (FLNA) grew revenues by 3% in the first quarter, driven by 2 percentage points growth of price, and one of volume. While Frito-Lay North America (FLNA) contributes to roughly a quarter of the company’s revenues, its share of the total operating profit is about 42%. We expect the strong growth rates of FLNA to continue in the future, boosted by the segment’s foray into new products and healthy snacks. For example, due to the success of Lay’s Poppables, launched in 2017, FLNA extended the Poppables product line-up with the introduction of new Lay’s Poppables Honey Barbecue and a 12-count multipack of Poppables Sea Salt. The company has also extended the Simply sub-line (which offers natural and organic versions of popular snack brands) by introducing new package varieties with the Simply variety pack and a three-flavor lineup of single-serve packages for Simply Lay’s, Cheetos, and Doritos offerings. To address consumers’ desire for greater flavor and product variety in single-serve multi-packs, PepsiCo launched a 20-count Family Fun mix that includes a variety of products, including Lay’s, Cheetos, and Ruffles, with an expanded mix of flavors, which helped drive 10% net revenue growth in the overall variety pack business. The company also launched Ruffles Mozzarella ‘n Marinara and Doritos Blaze, which helped to improve Ruffles and Doritos sales by 10% and 6%, respectively.